Linda Carnaby lives with husband John and their small family of Boxers on the borders of London and Hertfordshire. Her first Boxer, a daughter of David Spencer and Gert Neilsen's Wardrobes Man in the Moon - was born in 1969 and she became the foundation and inspiration for a long involvement with the breed. Because of limited space in a town house, and work commitments, means Linda is only able keep a few Boxers and have an occasional litter but despite these restrictions she has kept active in the breed for most of that time. 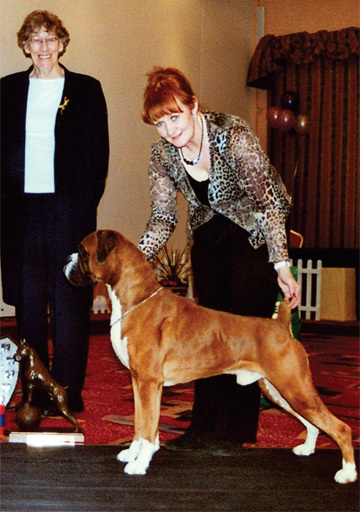 The majority of her Boxers have won consistently at championship show level, but the real star was her big winning dog ‘Jazz’ (Ch. Tartarian Gold Dust). Apart from his many achievements in the ring he sired her next champion - Faerdorn Dusted Over Tartarian, who in turn is the dam of the latest — Ch. Tartarian Kicks Up A Dust. In 1995 she joined The ‘Boxer Quarterly’ Team to produce their magazine, and has done so ever since. Spanning the decades from the '80s to the '90s, Linda served on the committee of the British Boxer Club for more than sixteen years, and was on the sub-committee that staged the first ever 'Boscars'. While on the committee Linda, together with her good friend Robert McDougal, edited and produced the BBC Newsletters and Year Books and also the British Boxer Club Record Book Volume II. Now out of print it includes all the British Champions from 1976-1990 with five generation pedigrees, lists covering the sires and dams of all CC and RCC winners back to the very beginning (1939), and championship show results from 1976. 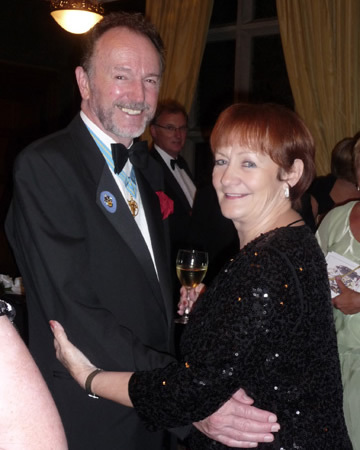 In 1987 Linda was made a Vice-President of the British Boxer Club and has now been made President. She also has the honour of being Patron of the Essex & Eastern Counties Boxer Club and was a founder member of the Club when they formed in 1986. 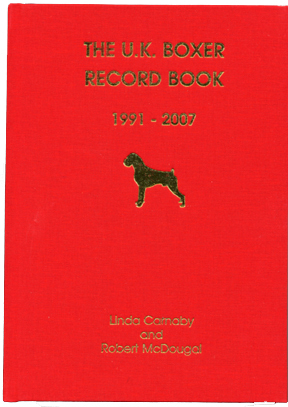 In 2008, with the generous financial backing of Val and David Jordan, a third Record Book brought the team of Linda Carnaby and Robert McDougal together again to compile the new Boxer Record Book, covering 1991 — 2007. This was published in the same format as Vol II but with photographs (where possible) in colour plus the added attraction of all the Boxer Best In Show winners. 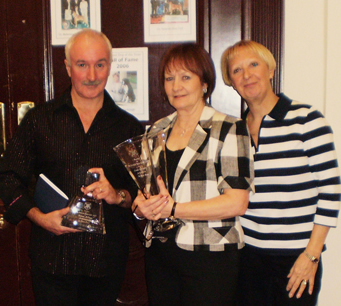 Linda and Robert were honoured to receive an award from the Scottish Boxer Club in 2009 for 'Services to the Boxer Breed' in recognition of their efforts in its production and are pictured here with Val Jordan. More details on the Record Book can be found here along with world-wide reviews.